Many of us are guilty of neglecting our medicine cabinet – specifically our old prescriptions and needles. Holding on to them as a “just in case” or because they were expensive. So, how do we properly dispose of these potentially harmful items? We talk with Kimberly Cimarelli, Penn State Health Milton S. Hershey Medical Center Pharmacy and Officer Rebecca Kessler, Derry Township Police Department. Description – The video begins showing a large, orange sharps container sitting on the grass with a sign above the sharps container that reads, Drive-Thru Drug Take Back. The camera then pans to the right to show three people standing outside in front of the Academic Support Building on the Penn State Health Milton S. Hershey Medical Center Campus. The three people include, from left to right are, Scott Gilbert, Kimberly Cimarelli and Officer Rebecca Kessler. Scott Gilbert is holding a microphone. Scott Gilbert: From the campus of Penn State Health Milton S. Hershey Medical Center, welcome to another edition of, Ask Us Anything About… I’m Scott Gilbert. 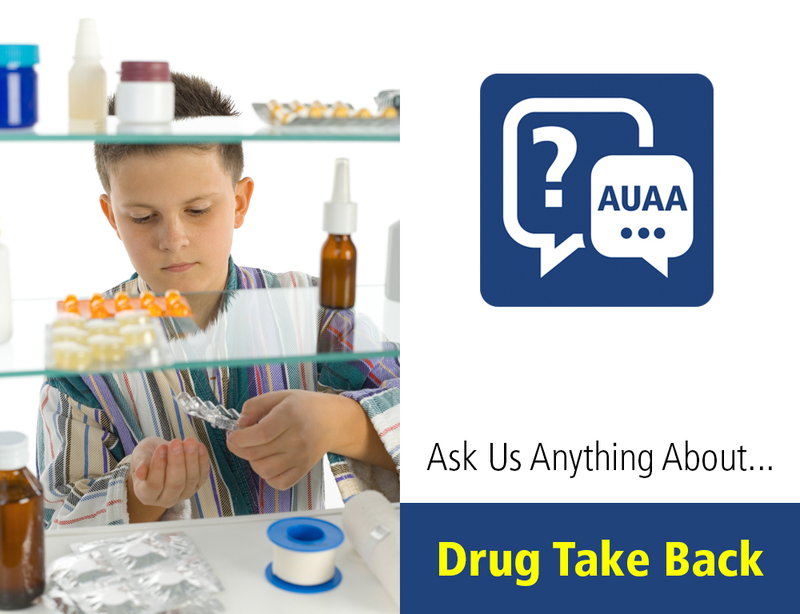 Today, we want to talk about those pill bottles in your medicine cabinet. How many of those are for current active prescriptions and how many might be left over from a few months, a year, even five or more years ago? We want to talk about a special event happening this weekend on the Hershey Medical Center campus this Saturday from ten until two. There will be a prescription drug take-back event happening here, where you can bring old, unused, unneeded, unwanted prescription drugs as well as needles and syringes to have them properly disposed of. It’s a no-questions-asked event. You bring them, drop them off anonymously and they’ll be taking care of. Here to talk more with me about that event and the reasons for Kimmy Cimorelli. She’s an inpatient Pharmacy Manager here at the Medical Center as well as Officer Rebecca Kessler with the Derry Township Police Department. Thanks for being here today, both of you. Kimberly Cimarelli: Thank you for having us. Scott Gilbert: Let’s talk a little bit about expired prescription drugs and why it’s just not a good idea to have them around starting with the fact that, I mean really that they’re not of use after a certain amount of time, right Kimmy? Kimberly Cimarelli: Yes, and the efficacy of the drugs won’t be effective and so we really need to make sure that they’re different disposed of properly because we want patients to actually take medications that they need to not ones that are expired. Scott Gilbert: And it also runs the risk of having people like children come across them accidentally. Kimberly Cimarelli: Yes, medications look like candy to children so we want to make sure that they are out of the medicine cabinet and in a proper disposal like what the Derry Township Police has or what we are doing this weekend. Scott Gilbert: And sometimes, people may come across those medications officer Kessler and maybe not so accidentally take them. Officer Kessler: Right, unfortunately there’s a high-level of abuse now of prescription meds and if they can’t come across the meds legally then they’ll start to take them from other people’s medicine cabinets and so it invites crime by leaving it behind. Scott Gilbert: There’s new numbers from the DEA that show that those numbers are in deed on the rise. Another temptation that could come, as you know, if I say, well, I took that medication for that illness six months ago back when I had it,what do you know I have the same infection again, I can just take the same drug again, I’ll just self-medicate? Kimberly Cimarelli: Well, do you really know if that’s the same infection that you have right now and does that medication treat that specific illness that you have and plus, drugs can become resistant after awhile so, if you start taking a medication that you don’t know what it’s for or because it treated something in the past, it may not treat something in the future because of resistance. Scott Gilbert: You’re watching ask us anything about, from the campus of Hershey Medical Center, I™m Scott Gilbert alongside Kimmy Cimorelli also officer Rebecca Kessler. We’re talking about the prescription drug take-back event that will happen this Saturday between 10am and 2pm here at the Academic Support Building. The mailing addresses 90 Hope Dr., Hershey PA 17033. So, if you plug that into your GPS, it will get you here to the parking lot and we’re going to talk a little bit about that event and kind of the format will take very shortly here. But I’d also like to talk about the other ways that people sometimes get rid of prescription drugs apart from events like this it could involve flushing them down the toilet out-of-sight out-of-mind any problem with that? Kimberly Cimarelli: Yes, that gets into the water system could be harmful to the community so we want to make sure that it is disposed of properly and we have what we’re doing this weekend it will be incinerated and it goes right to the DA and then becomes incinerated. Scott Gilbert: What if I throw those medications in the trash in the garbage is that a good idea? Kimberly Cimarelli: Well, if you throw in the trash then it ends up in our landfills and ends up in the soil system and we want to obviously keep it out of our water systems as well. Scott Gilbert: Now, as I mentioned earlier, we are also accepting needles and syringes at this Saturday’s event here in the Hershey Medical Center campus. So, I would like to shift gears to that and talk a little bit about, if you could Kimmy, the wide range of patients who might have a need for getting rid of those kinds of materials. Kimberly Cimarelli: So, you could have insulin needles for diabetic patients. Their could be anticoagulation medications that are out there that could be injectable and also hospice patients, there is a lot of medications associated that are injectables that you want to throw away needles and syringes properly. And like I said before it could be anywhere up to 250 dollars to dispose of them properly, so we are doing this as a service to our community into our patients to make sure that we get rid of them properly. Scott Gilbert: And again, putting these in the trash also a bad idea but for a different reason right? Officer Kessler: Absolutely, you don’t want your trash collectors or anybody else that might handle the trash to get stuck by the needle especially if somebody has a virus or there’s an illegal drug still remaining behind in that syringe. Because obviously, the other people probably don’t want to receive that and also, you just want to make sure to take care of everybody, you don’t want somebody to be tempted that doesn’t have access to a clean needle to go and reuse that dirty needle. Scott Gilbert: As you watch, Ask Us Anything About, here from the campus of Hershey Medical Center we welcome your questions. Feel free to add them to the comment field of this Facebook post and we can pose them to the experts here or even after if you’re watching this video on playback, after the fact and not live. We can still get those questions to these folks and will post those answers as a comment as well. So and again, I™m talking with Kimmy Cimorelli the inpatient pharmacy manager here at the Medical Center as well as Officer Rebecca Kessler with the Derry Township Police Department and this Saturday’s event from 10 a.m. to 2 p.m. here on the campus of the Medical Center at the Academic Support Building. Also just a quick reminder that if you follow us on Facebook, click on that follow button on the Penn State Milton Hershey Medical Center™s Facebook page. You can follow us and get notifications about similar interviews just like this in the future. We’re talking about a syringe and needle disposal, some people keep those in an old laundry detergent container in that that can be safe? Correct? Kimberly Cimarelli: It can be, you want to have something that’s hard plastic, something that the needle can’t get through because again, you don’t want anybody to be stuck with that needle or and in the future. So needles syringes unused unwanted prescription medication all welcome this Saturday at the event. Scott Gilbert: Tell me a little bit about how that event will work this weekend. Kimberly Cimarelli: So it’s a drive-thru event, we will have cars pull up, we have a handout about medication safety, that’s the first stop they’ll make and then there’s two stops for either medications to be disposed of and then the next stop is for needles and syringes to be disposed of. Kimberly Cimarelli: And Officer Kessler, one concern some people may have is well my pill bottles have my name and personal information on them, is it necessary to remove those labels before coming to the event? Officer Kessler: They don’t have to, what happens is once they drop the medications into the box, once that box gets full, I seal that box shut and then it gets transported to the DA’s office in Harrisburg and then the DA takes care of incinerating everything so that bottle should never see the light of day again. Scott Gilbert: And this is a drive-through event happening this weekend right now what does that mean? Literally, just stay in your car drop and go? Officer Kessler: Stay in your car, make the necessary stops that you have to and then you’re on your way out the door. It’s completely anonymous, completely free. Scott Gilbert: Fantastic! And again, that’s happening here the Academic Support Building, the mailing addresses 90 Hope Dr. it’s here on the campus of Penn State Health Milton Hershey Medical Center in Hershey. Any closing comments from either of you as we bring this edition of ask us anything about to close? Kimberly Cimarelli: We hope to see you at the event and we want to stress that this is one of the only locations taking care of disposing a properly needles and syringes. Officer Kessler: Pretty much what she just said! Scott Gilbert: Fantastic, thanks to both of you for being here today and thanks for having this event on Saturday. The other thing I do want to mention, kind of as a postscript here, is that the Derry Township Police Department is one of many that has a drop-off location where you can drop prescription medication off 24-7. Right? Officer Kessler: Yes and our station is located at 620 Clear Water Road in Hershey. And it’s a 24-hour, seven-day-a-week lobby so you can go in anytime, three o’clock in the morning if you want, to dispose of those Meds. There’s only certain limitations that are posted on that box, mainly no liquids, no needles and I believe it’s no aerosols are allowed in that box. Scott Gilbert: Great! Thanks again to you both for being here today and we hope to see you this Saturday here on the campus of the medical center for this event, this drug take-back event at 90 Hope Dr. Hershey PA. That’s ready a type into your GPS and it will get you here. Thanks a lot for tuning in to this edition of Ask Us Anything About… from Penn State Health Milton S. Hershey Medical Center.